When I get a respiratory cold or flu, my medicine of choice is a multi-symptom medicine. 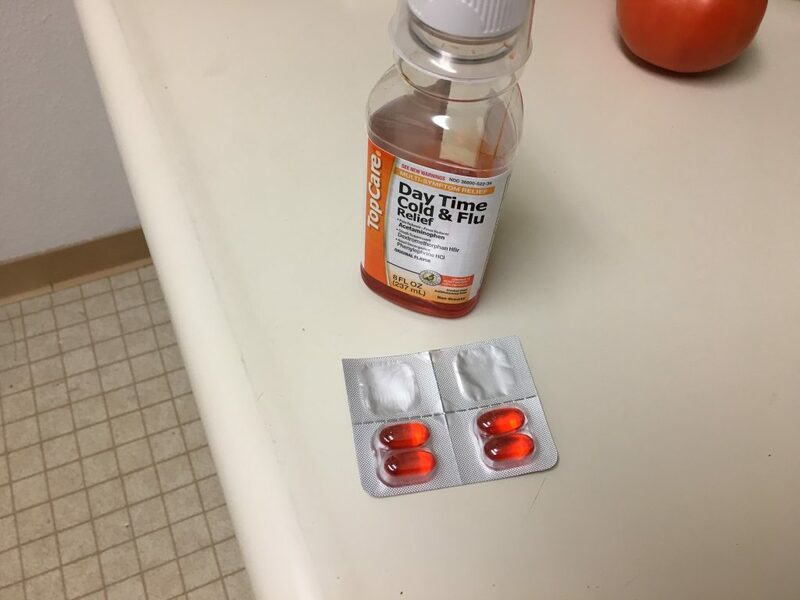 The brand name is Dayquil, but I often get the generic version. I usually get the pills. They are super-big. I have trouble swallowing them, but it’s nice how portable they are. This time around, I’ve been using some leftover pills I had from before, but I also got a bottle of liquid. It’s so much easier to swallow, and it makes me think the medicine is being absorbed right into my throat. I’ll keep using the pills for when I go to school, but I like this liquid for home. Have you thought about dissolving the pills into a drink? You could invent a really terrible-tasting cocktail. Drink lots of water!!!! Flush out the poison!! I’m sorry your not feeling good but at least you can be home. Don’t push yourself…..eat good protein….drink lots of water.